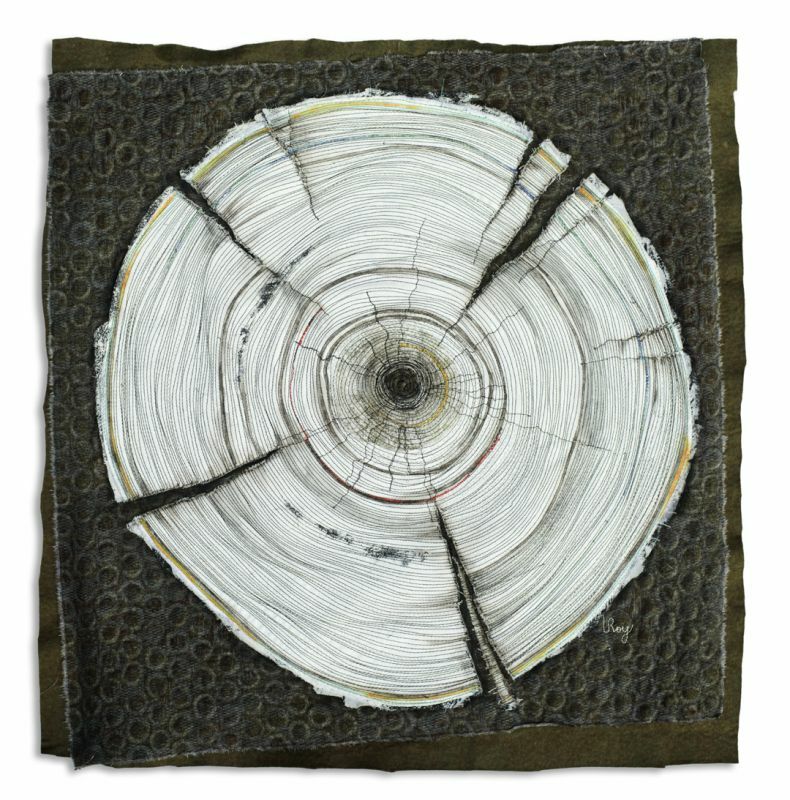 I wanted to know what it would be like to recreate, with sewing thread, the tree rings of a 100 year old tree. Along with the dark lines, I added accents of coloured thread - gold, red and blue, to signify drought, fire and rain - the history tree rings record as the tree grows. Not visible in the photo are strands of silver metallic thread winding through. With my tree rings pieces, I examine how trees faithfully hold their stories within them, just as they commit to staying on one piece for earth for their entire lives. Still, they thrive, communicate, and contribute generously to the health of their surroundings. This was a long project - sewing that many rings, even with a fast machine, is a dizzying experience! "When a tree is cut down and reveals its naked death-wound to the sun, one can read its whole history in the luminous, inscribed disk of its trunk: in the rings of its years, its scars, all the struggle, all the suffering, all the sickness, all the happiness and prosperity stand truly written, the narrow years and the luxurious years, the attacks withstood, the storms endured. And every young farm boy knows that the hardest and noblest wood has the narrowest rings, that high on the mountains and in continuing danger the most indestructible, the strongest, the ideal trees grow." 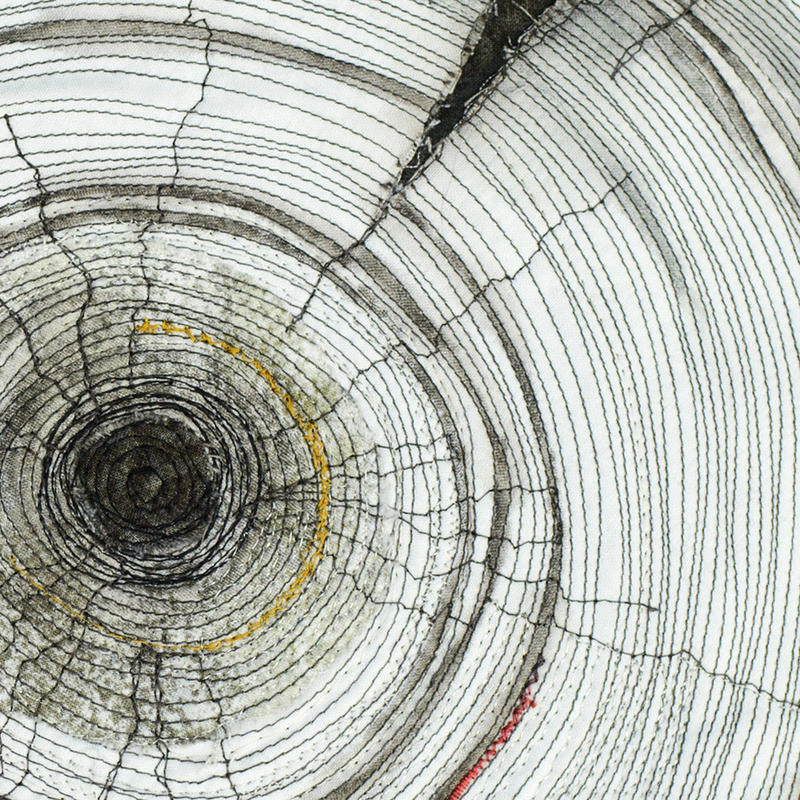 A series of works inspired by the fascinating growth rings of trees. Also featuring the elegant coiled vessels of textile artist Carmella Karijo Rother.